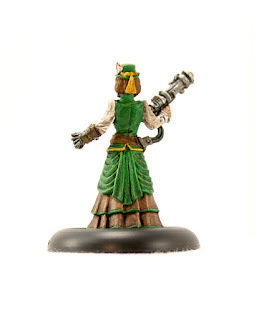 Hubs has been running a semimonthly Deadlands RPG for a few friends and I. I bought this nice Mad Scientist Reaper model to paint up for my character. Reaper has some really nice Savage Worlds figures, including hucksters, outlaws, and bone fiends, if you're into that sort of thing. In the game, her name is Trixie. She hides all sorts of useful things in her bustle and she's pretty keen on shooting that lightening gun. I had a fun time working on her. Sometimes it's nice to take a break from a big army project and just do a single figure. Painting her was an enjoyable, leisurely time rather than a "get it done" batch painting. I'm still having a bit of a trouble getting the skin tone to look just right. It worked out a lot better on my Dwarfs than it did for her. In fact, her face in general was really hard for me. This is the first time I've had any serious trouble with one. I think the face on my Pleasuredaemon came out better with a lot less effort. She just needs to be based now, but I have time. We've been having a little trouble scheduling dates to play the game lately, as life tends has been in the way. Hopefully we'll be able to get back into the swing of it soon. It's always a little bit more fun to play with painted characters. Very cool. Steampunky and pulpy all in one. 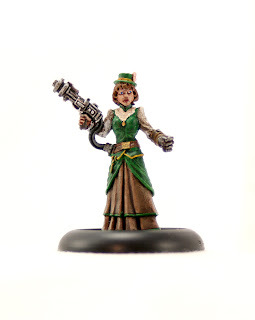 You should check out the rest of Reaper's Savage Worlds figures if you like the steampunk look. They have a whole pile of cool ones, including another mad scientist.